Helen has family in Hong Kong. If you don't visit, you lose those connections so we visit. 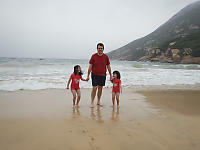 It's been 18 months since our last trip to Hong Kong - this is Claira's third trip, Nara's fifth trip and my tenth. This is our first time visiting in March (it's Spring Break in Canada). The goal of this trip was to visit family, try some new things and repeat the things we enjoyed previously. We tried to organize the trip as alternating "Big Activity" and "Small Activity" days, but things don't always work out as planned. This time Nara was very keen on having her photo taken - she wanted to stay home and color. Claira was more flexible, especially if there was an egg tart at the end of the walk. Our favorite time for photos was in the morning before the tourists arrive in large numbers. Nara and Claira begin their bath time around 7:30 pm so there isn't a lot of time after dinner for walking around. One evening on a small activity day, we decided to walk over to the goldfish market. We don't have pets at home so seeing all the animals leads to lots of questions. We got to Hong Kong primarily to visit Helen's Grandfather. Mui Wu Bay seemed like it make everyone happy. They have a bicycle rental store where the kids could get bikes. They are known for seafood so there is a nice lunch. It has a beach - who doesn't like the beach? We haven't been there is like 9 trips. What's not to like? The internet misled us a little about the bike store - they don't rent family bikes (anymore). Claira (who is three) can't bike long distances yet with her training wheels. Nara just wanted to bike and bike and bike. The restaurants serve family style dishes, but with only one real seafood eater (Helen), there wasn't enough demand to really get a few different plates. It turned out to be a foggy/cool morning so the beach and waterfront promenade was basically empty. I've never seen a place in Hong Kong I would call "Bicycle Friendly", but this may be the best. The roads were flat and wide with few pedestrians and no curbs. Nara enjoyed the ride. My favorite bit was near the start/end - there is a restaurant where the open air seating is on the opposite side of the bike route from the kitchen. Basically, you are biking through a restaurant - servers cross with dishes of food in hand. I haven't seen anything like that in Vancouver. Nara got quite sea sick from the boat ride over so we took the bus and MTR back to Mong Kok. She fell asleep on the bus. I've known about Kadori farm for years, but only recently realized it's enough of a tourist attraction to take the kids to. It's a KCR ride from Mong Kok, followed by a bus which is always a bit tricky if you don't know where to get off. The farm is setup for kids, but it is on the side of a mountain so most walking involves walking uphill or down. There are a lot of enclosures showing native (and once native) animals that you might have found in Hong Kong. A large number of animals are either surrendered pets (think parrots and monkeys) or confiscated illegal trafficking (turtles, lizards). It makes for a nice zoo with a lot of emphasis on environmental stewardship. Among all of these enclosure are actually native animals looking for a meal from the tourists. There is a large picnic area (think school trips) where kids abandon their half eaten lunches and a mob of house sparrows clean up the crumbs. Higher up, we saw a monkey walking into the fruit orchards. I was happy to think I had found a native monkey to Hong Kong, but there are so many released pet monkeys in Hong Kong, it could just as easily be monkey from another part of Asia. We had a good time, but we didn't really plan for all of the vertical traversal. Claira got tired quickly so we headed home for her nap. I've been to Mai Po Marshes three times before this trip and I even made it out to the the ocean front hides once. I finally got up the nerve to call myself a naturalist (I joined Nature Vancouver) and apply for an overseas Naturalist pass. The WWF people were really nice and I got a pass! I booked a Wednesday hoping when the tides were low and took the taxi out to Mai Po for 9am. A bit of paperwork and I was on my own out in the reserve. Mai Po is huge (km x km) and felt nearly empty - I was really happy that I had been a few times already and knew my way around already. I headed straight for the floating boardwalks that take you to the ocean front hides. The Mangrove forest is an inter tidal buffer between the ocean and the shore and the water level changes throughout the day. Walking alone in a bird filled forest is so the opposite of what I normally experience in Hong Kong, I was almost giddy. There are three hides on Deep Bay, each with a view of of Shenzen. The view never gets old for me - today the weather wasn't great so you couldn't see very far into the city, but you could still see a monster city looming on the far shore. It's luck of the draw what you get in each hide. Right after opening the wooden shutter I could see a kingfisher perched in a tree. After taking the best photo I could (no rush - the birds don't seem to notice you in a blind so they seem extraordinarily patient), I took in the rest of the scene. 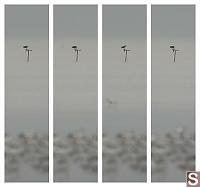 The Pied Avocets were the most common bird of the day and the larger flock was further west - toward the center blind. The centre blind is where the large flock was most visible. Hundreds of birds, mostly sleeping, some feeding closer to shore. This is the first time I've seen Pied Avocet's - they are a larger bird with a distinct up turned billed. They have also have a distinct feeding style - the upturned part of their bill is submerged into the water and raked side to side as the bird slowly walks forward over the mud. Apparently they filter small food out of the mud. While the Avocets dominated the scene, there were many other species mixed in and around the flock. Furthest out in the bay was an Osprey feeding on a recently caught fish. This bird was very distant, but even as a small spot, it's quite distinct. Closest to shore, I spotted a Dusky Warbler drop out of the underbrush and explore the highest inter tidal looking for a meal. Great Egrets walked by, standing well over the other birds, while sandpipers and other ocean birds mixed in. I visited all three binds and then started heading back to the office. I got caught in a sudden storm and was soaked to the bone - thankfully I remembered the bring a garbage bag to cover my backpack. As I took the taxi back to the KCR station, the storm stopped as suddenly as it started and I wished I had stayed out even longer. A great day - I'm already looking forward to going back again. Man Mo temple is one of my favorite places in Hong Kong, just because it has such a signature look. It's really close to downtown (lots of nice food). We took the MTR over and walked up. We aren't a church/temple going family so the kids have lots of questions about temples and why people are there. We tried to explain it as a place where people remember family and friends that are no longer with us, and where they leave hopeful notes about what will happen in the future (like passing an exam). The kids were really good in the temple - no running. Thankfully there is a playground just across the street. After this we took a walk down Hollywood road - an area with a concentration of art galleries, many hanging works well over the value of any car I would consider buying. We poked into one and the kids started behaving poorly - they wanted to touch. Sadly, that was the last gallery we saw that day. Favorite easily accessible beach in Hong Kong - Shek O is on the open ocean side of Hong Kong Island and it has a lot of family restaurants near the beach. Going out was a "big activity" day, but the kids love the beach and I love the view on the way in. It's March in Hong Kong - not a warm month. A few people visit the beach took their shoes off and touched the water, but no local was really going for a swim. For hardy Canadians, this was a nice beach day - a little foggy, but certainly warm enough to get a little wet. There were no life guards on duty and the water wasn't calm so there were announcements (in Chinese only) actively discouraging swimming. I find after a day at the beach, the kids nap really well. Tai O is a favorite of ours. Because of the weather (days of rain) and our agenda we wound up going on a sunny Saturday morning, the first sunny day in a week. If you can visit the prime attractions mid week, life is usually a little easier, but Saturday is all we had. The line up's for the buses were crazy, but they did move. The bus ride has lots of hills and sharp corners and Nara (who suffers from motion sickness) looked pretty much green after the 45 minute ride. 橫水渡小廚) - it had no shortage of customers. Helen had a meat eating companion for lunch so she got to order a larger variety of seafood for lunch. The kids like the basic - pork and breaded fish. I like a vegetarian dish (I was missing broccoli and I quite enjoy lily bulb) so Helen and Jennie had steamed fish (a common dish with very fresh seafood) and razor clams. On our last visit a year ago, we did the "village and dolphin" tour - a 15 minute ride for something like 20 HKD. It was quite memorable - the kids asked us questions about dolphins for months. I suspect the previous trip was exceptional - some days they don't see dolphins at all so we previously really lucked out to see dolphins. Today we tried again but didn't see any dolphins in our 15 minute cruise. Claira was so keen, she asked we go a second a time. Second trip, we did see dolphins. Nara got sea sick on the first trip out and didn't go on the second.